InStyle presents the "The World's Coolest Caves You Can Actually Sleep In" that can be rented via Airbnb and three of them are located in Santorini. The US magazine notes that "if you've ever wanted to get away, here's your chance to do it caveman style. When four restricting walls, a flat screen TV, and a mini-bar fridge just doesn't cut it for you, broaden your imagination and try booking a cave. These hidden chasms all have their own unique history and mystery that make staying there an unforgettable experience. Not to mention that the advantages of staying in a cave room are plentiful—no suffocating humidity, constant cool temperature, peace and quiet, and most importantly? No annoying crowds to disturb your rejuvenating getaway. Don't worry—while the cavemen back in the day might have been a bit more animalistic for our liking, these options offer all the amenities you need for luxurious living. After all, not all caves have to be cold, gloomy, and damp; these cave hotels are chic enough to make even Batman jealous. Check out some of our favorites below: all reservable via Airbnb." 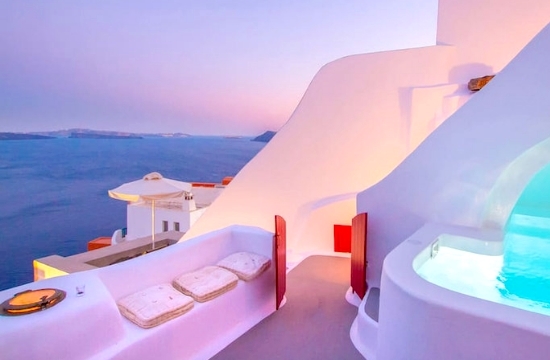 Santorini, an island in the Aegean Sea, is a dream vacation for any adventurer, especially those who crave unconventional trips such as roaming an active volcano or exploring obscure cave dwellings. This insanely gorgeous Lava Cave used to be a sailor's domicile back in 1875. After a full restoration, it has been transformed into a hidden and livable jewel, keeping its traditional cave-curved Aegean island style with its stark white walls. Its indoor suite includes a cozy bedroom and an adjoining living room and kitchenette en suite. The beautiful private veranda and exquisite indoor-outdoor Jacuzzi offer a natural splendor of Caldera's rugged volcanic beauty, overlooking the crystalline waters that surround the area. Situated in the foothills of the Drakensberg mountains, Inkunzi Cave's totally unique design with a Bushman theme incorporates self-catering units, replete with rock pools and baths. This true getaway is sure to ignite a party for the senses. Nestled in the nook of greenery, this property treads delicately on the aesthetic landscape. This unique experience that literally lets you sleep inside the earth holds a constant temperature throughout the year and provides breathtaking views to the world heritage site. This charming cave dwelling in the heart of the Sassi perfectly blends the magical feel of the old tufa caves with all modern comforts we know and love. The house itself is dug in the soft calcareous tufo stone and is a typical underground vaulted dwelling. Consisting of an open space of over 100 square meters, it boasts a large patio overlooking the rolling hills of Sassi where you can enjoy scenic aperitif and panoramic views. The ultimate rejuvenation zone, the cave even includes a "relaxation area" in the lower level where you can enjoy a large bathtub and complimentary massage mats. This Sacramonte haven is placed on the heart of the genuine neighbourhood of Sacromonte, 5 minutes away from the most emblematic places for flamenco and 20 minutes away from the city center. Explore the surrounding rugged and stunning outback in their lush garden and terrace facing Alhambra. The place also maintains a steady temperature throughout the seasons, and for those sensitive to the cold, there is a chimney and electric heating that you can circulate throughout the cave itself. Nature buffs, this one's for you. Set amidst towering escarpments, the Hat Cave is a massive sandstone cathedral, sculpted by nature to provide an ideal bushland retreat for troglodytes (modern cave dwellers). Hatter's unique hand-built lodge and environmental retreat on eight rolling private acres of Blue Mountains wilderness is perfect for those in dire need of an otherworldly landscape. The cave is 20 meters high, similar size and shape to a small shell of the Opera house (with better acoustics!) Hatter's Hideout transects a deep mountain gorge, with lush cool temperate rainforest to natural bonsai to provide panoramic views across Mount Wilson and Wollemi National Park. The experience may feel a bit like camping, but with beds and all other accommodations provided. This old style little villa is in the Natural Park of Le Manie, and has been renovated with handicraft work conceived as a perfect gateway location within nature. Its natural elegance is ideal for a couple looking for a romantic hideout; to reach the house you have to leave the car on the main country road and follow a path for about 150 meters down a hill (no pesky neighbors here). At the villa, you'll be able to enjoy a breathtaking terrace with delectable complimentary breakfast, sunset aperitifs, barbecue dinner, and relaxing sunbeds. While there are underground options, you can opt for the dug-out style living and find everything you need aboveground — high up on a cliff. The Hector Cave House, carved into the unique caldera cliff for more than 250 years, was originally used as a wine cellar back in the day. The traditional canava eventually became a family owned summer house, which then opened its doors to share its unique character and intriguing architecture to travellers all around the world. The bedroom has a built-in elevated atop a loft and the private veranda offers a romantic, private space for dining and sunbathing. Oh, and did we mention the outdoor Jacuzzi? We're sold. A carefully restored old cave house in one of Santorini's most spectacular and beautiful locations, Sunset Cave literally hangs on the caldera cliff, right underneath the old caste in the picturesque village of Oia. Sitting 150 meters above sea level, you can marvel in its sprawling surroundings whilst lounging in a private outdoor whirlpool. It's the perfection fusion of luxury and style, with just the right ration of adventure.